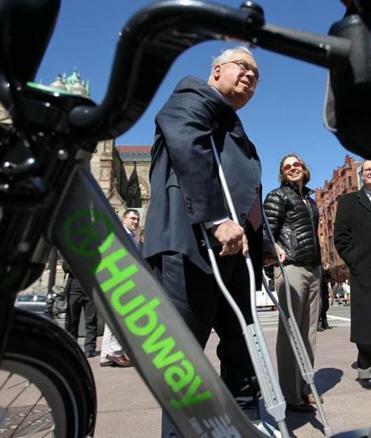 Mayor Thomas M. Menino said Nicole Freedman was leaving as the Hubway bike-sharing service celebrated its anniversary. Nicole Freedman, the director of bicycle programs for the City of Boston, said Tuesday that she will step down this month to take a job in Maine. Freedman, a former Olympic bicyclist, began her job in 2007 and is widely credited with helping to bring bicycle lanes to the city and raise overall awareness of bicycling in Boston, which had been known as an unsafe and unpopular place for bicyclists. “This has been an incredibly tough decision,’’ Freedman said in an e-mail to bicycling advocates. She said she would become executive director of Maine Huts and Trails. Freedman joined Mayor Thomas M. Menino and dozens of bicycling advocates Tuesday to formally kick off the second year of the popular Hubway bike sharing service outside the Boston Public Library. Menino publicly announced Freedman’s departure. Since Freedman began her tenure, Boston has installed more than 50 miles of bike lanes across the city, including routes along Massachusetts and Commonwealth avenues, established its bike-share program, and this year put more than 1,000 bikes in the hands of low-income residents. The city plans to add 15 to 20 more miles of bike lanes this year; install Hubway stations downtown and in more neighborhoods, including Roxbury, Charlestown, Jamaica Plain, and Dorchester; and offer community programs to get more donated and subsidized bikes and helmets in the hands of residents. Since March 15, 15,000 rides have been logged on Hubway bikes, which now has 5,000 members, Menino said. The program is expanding to Somerville, Cambridge, and Brookline this summer. Freedman, whose last day with the city is April 20, said she was confident the biking initiatives she helped launch would continue to grow in her absence. “The mayor has been a dedicated leader to the issue, and it will continue to be a great success,’’ she said after presenting Menino with his own Hubway bicycle at the official kick off. A Wellesley native, Freedman started her college work at MIT, then transferred to Stanford, where she got a bachelor’s degree in urban planning. From 1994 to 2005, based in the Bay Area, Freedman biked full time as a professional racer, and competed in the 2000 Olympic Games in Sydney. Her arrival as the so-called “bike czar’’ coincided with increasing popularity of bicycling in general, and advocates hope that popularity will continue. Jackie Douglas, executive director of the transportation advocacy group LivableStreets, said the organization’s fourth annual Boston Bikes Update listed many accomplishments that were partly attributable to Freedman. “She’s done an incredible job building the program and making changes,’’ said Douglas. “There’s still more work to be done, and we want to see more infrastructure and changes in our street designs to make biking safer and more attractive to more people,’’ she said. Johanna Kaiser can be reached at johanna.yourtown@gmail.com. Follow her on Twitter @JohannaKaiser.